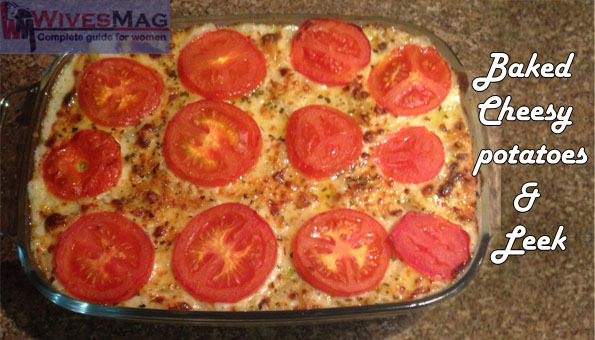 People mostly like oven meals as they quite easy and quick to prepare. So, today I bring you a delicious oven recipe, using very simple and inexpensive ingredients. Yeah, I’m going to prepare one of most famous Italian recipes. It’s baked cheesy potatoes and leek. The main ingredients of this easy recipe are potatoes and leeks. And both these ingredients are much healthy. The potato recipes provide body with an essential source of fuel and energy. It’s what we need, even when we are dieting. A baked potato has just 26 calories and full of nutrients. In order to weight loss we need to eat complex carbohydrates. For example potatoes, rather than simple carbohydrates such as sugar cookies. After eating potatoes (high caloric value) no one feels hunger while sweet cookies give a boost of energy followed by short hunger. Thus, potatoes can help reduce again and again eating habit. Potatoes are also a rich source of vitamin B, folic acid and minerals such as potassium, magnesium and iron. Potatoes are underground roots and store all the vitamins and minerals. Kukoamines is found in potatoes, help reduce blood pressure. It is thought that eating 2 potatoes per day can help reducing blood pressure. 60 different kinds of photochemical and vitamins are found in potato skins. Many of them are the flavonoids that protect against cardiovascular disease. They lower the levels of LDL bad cholesterol and keep the arteries healthy. High levels of dietary fiber found in potatoes support healthy digestion. They regular bowel movements and avoid colon cancer. The potatoes are extremely rich in vitamin B6, a substance required for cell renewal to build healthy nervous system. The same way, leek also rich in dietary fiber. Leeks also have diuretic properties that allow us to combat fluid retention. It’s very tasty vegetable and low in fat. It can be used in pasta recipes, leek recipes, steamed or soups and other easy baking recipes, offer lots of nutritional and medicinal benefits. They are rich in vitamin B9 or folic acid, which helps the body make new cells. Also, maintains healthy blood to oxygenate the organs. Leeks provide calcium to strengthen bones and teeth. They are an important source of potassium that balances levels of water and pH of the body. Provide vitamin C to repair the body’s tissues. Reduce the risk of cancer of the prostate, colon and ovary. Ready for this delicious and nutritious recipe? Clean the leeks and julienne cut it. Peel off the potatoes and diced it properly, about 1×1 inches. Avoid to dice finely. Now boil the potatoes till tender. Add olive oil in the pan and add sliced garlic. When they turned golden, add julienne leek and stir well. Boil the pasta till tender. And strain it. I used sedani rigati pasta, you can use any one easily available you. Pre-heat the oven at 250 °C. Heat up the pan and add butter to melt at medium flame. When the butter the melted well, add plain flour. Stir it continually and thoroughly to avoid any lumps. Cook this mixture over medium heat until it bubbles (about 1-2 mins). Don’t let it turn brown. Now add Chinese salt, black pepper, oregano and chicken cube. Mix it well. Now add milk slowly. Continue stirring while adding milk. When the mixture gets bit thick, add cheese into it. And mix well. The sauce is ready. Now add the fried leek & garlic into it. And mix well. Pour this mixture into a glass try. Add boiled potatoes & boiled pasta. Mix them well. Now sprinkle shredded cheese on the top. After 5-7 mins, remove from oven and arrange tomato slices. Put in oven again for 1-2 mins. Baked cheesy potatoes and leek is ready. Serve it with boiled broccoli and cauliflower.